Government Higher Secondary School (GHHS), Bilat, representing Arunachal Pradesh in the 64th National School Games (NSG) Football U-19 Boys Championship 2018 won four matches in the tournament so far. The tournament is being by organized by the School Games Federation of India from November 14 to November 19 at Pacher-Bari in Jhunjunu of Rajasthan. 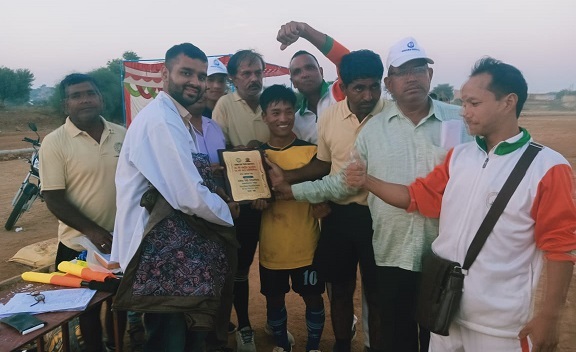 In an exciting match played on Saturday morning, Team Arunachal defeated Telengana by 5 goals to nil while it also defeated Delhi by 3-1 goals in the second match. In the first match, Franklin Taki was adjudged as man of the match for his brace while India Saroh, Neymar Pajing and Gospel Radeng scored a goal each. The second match against Delhi saw Nangku Tamat adjudged as the man of the match while Franklin Taki, Kamin Jamoh and Neymar Pajing netted a goal each for Arunachal. With the wins, Arunachal has topped its respective pool and reached the pre-quarters of the competition which will start from tomorrow. “Arunachal defeated Madhya Pradesh and Dadra and Nagar Haveli prior to the win today,” informed Team Manager Tashi Padung. Last year’s State champion GHSS, Bilat were also supposed to represent the State in Subroto Mukherjee Cup this year, but the Directorate of School Education had delegated the GHSS, Daporijo to represent Arunachal Pradesh in its place. Reportedly, after the protest to the office of Secretary Education, GHSS, Bilat was given a chance to participate in the National School Games Football U-19.